As stated on the main page, these locomotives were one of the two initial releases by Atlas in 1967. The model can represent either an E8 or E9 because there were no external differences between the two prototypes. Both were originally sold for passenger train service although some railroads used them in freight service as rail travel decreased. This was done with mixed results because the gearing was designed for lighter, faster use and not the heavier service freight trains required. At first, there were three roadnames represented in the Atlas line-up: Santa Fe, Baltimore and Ohio, and Pennsylvania. Later, Union Pacific and Chicago & North Western were added. All of these railroads did actually have E8s. The basic construction of the model is a plastic shell over a zinc alloy frame. The shell is held in place by lateral locks. I have always thought that the Rivarossi E8 carbody is a pretty good representation of the prototype in spite of the truck mounted pilot. The nose looks good and is a lot better than some of the efforts by other makers trying to duplicate the famous EMD "bulldog" front end. I know I read somewhere that the winterization hatches on the roof are about a foot too wide but they look OK to me. The front truck wheels are used for current pickup and the pilot is integral with the truck as opposed to being included as part of the body. This was common in the early days of N scale because of the unwritten requirement that equipment be operable with the small radius curves of the sectional track of the time. Current flow occurs thus: from wheels, to axles, to a phenolic P.C. board contacting the axles, to two metal plates with studs contacting the copper on the P.C. board (held by two screws) to a screw/spring combination contacting the front metal plate and screwed into the frame for the ground path and to a sprung barrel type contact mounted in the rear metal plate which pushes against the plastic/metal contact plate for the hot path. A wire conducts current from the contact plate to the hot motor brush holder and the ground brush holder makes contact with the frame through a flat metal spring contact. The rear truck is the drive. A vertically mounted, three pole, can type motor and kingpin worm and gear drive is utilized to power the two rear axles in the truck. The front axle is merely an idler. The headlight bulb socket is press-fit into a cast area at the front of the frame and this provides the ground contact. The circuit is completed by an extra contact on the contact plate pushing against the center contact of the bulb socket. A screw-in bulb is used. The manufacturing period for the E8s appears to have been between 1967 and 1969 based on my observance of the dates on the paper inserts in the boxes. The latest date on any of the units I own is 1-69. They were marketed until about 1973, however and I would be interested in hearing about any inserts with dates into the seventies. Atlas Identification: "ATLAS Made in Italy" cast into the underside of the frame in fuel tank area. "ATLAS MADE IN ITALY by RR" at center of underside of roof and the number 9982 on underside of rear winterization hatch, both molded into the inside of the shell. Rivarossi marketed these units on their own and this same shell was later used by Con-Cor over a Kato mechanism and it is even used on the latest Rivarossi/Arnold release so look for the Atlas markings to be sure of authenticity. Suspicion should, of course, be aroused by someone offering a unit with a roadname other than the five listed at the bottom of this page. The earliest units have a different silver color than later units. It is a duller, almost greener silver than the later carbodies. This is apparent when placing the two variations side by side. I have found four variations in the red used also. There is a bright semi-gloss, a bright flat, a darker semi-gloss, and a darker flat. I believe that the bright semi-gloss was only on the earliest units because my original E8 that I bought in 1967 (box insert date - 9-67) has this finish whereas the one I bought in 1969 (box insert date - 1-69) has the darker flat finish. I have seen the latter three variations intermixed on units from 1968 - 1969. There are variations in the brightness and opacity of the yellow Santa Fe herald on the nose. This ranges from a very bright and opaque yellow to a very dark and almost see-through yellow. I have also seen the registration between the yellow and the black lines being off. To see the variations between the silvers, bright semi-gloss red vs.darker flat red, and two shades of nose herald (some of the variations are subtle in the scan), click here: The top unit has the duller silver, brighter red, and brighter yellow herald. The difference in the two silvers is best seen on the edges of the winterization hatches. You can see the brighter light reflections on the bottom loco. I haven't seen any appreciable differences in these units. The parts, other than the motor, mounted to the frame (light bulb, front contact plate and wire) seem to have remained consistent throughout the manufacture period. Dallas Mallerich, in the Greenberg guide, indicates that some frames (chassis) had only two motor mounting holes drilled diagonally instead of all four holes but I have never seen any like this (although I have seen it with C-Liner frames). Also, it is difficult to tell if the holes are actually drilled or merely cast into the frame. The earliest units have the wheels merely rotating on the axles making contact with the phenolic contact plate with no springs. Next came mounting a different wheel on a different axle with a shoulder on it and a coil spring between them to maintain pressure between the wheel and axle for better electrical continuity. The latest is the sprung wheel/axle in conjunction with auxiliary contacts mounted on the truck frame. These contacts are sprung shoes that make direct contact with the rail for the ultimate in current pickup! The truck frames were changed for this also with holes to make room for the barrels of the contacts. Thus, you can't add the auxiliary contacts to older frames (a major disappointment when I was a young lad). For a full sized view comparing the non-auxilliary contact trucks with the later auxilliary contact version, click here: The unsprung axle trucks and sprung axle trucks look almost identical. If you look closely, however, with a sprung axle truck you can see the shoulder on the axle on the inside side of the wheel. If you push a wheel toward the center of the truck, the wheel will spring back towards the sideframe on a sprung axle truck. As an aside, it is easily apparent that Rivarossi made an effort during the manufacture of these units to improve the electrical pickup of the front truck because, after all, this is virtually the only place where effective pickup takes place! There may be some incidental pickup on the ground side of the rear truck through the wheels, gears, motor shaft, and motor can when one-side insulated axles are used. More on this next. It was a fairly major frustration with the earliest versions to keep pickup effective because it didn't take long for dirt to get between the contact surfaces of the wheels and axles and a stuttering E8 was the result! The earliest units have only one side of the wheelset insulated from the axle and, as a result, there is some pickup from the ground side of the truck. Not that it is reliable pickup what with all the parts current has to flow through and grease or oil on the motor bearings. These have to be oriented correctly, also, or a short circuit will result. Later units have both wheels insulated so the orientation doesn't matter. Of course, any current conduction is lost too. Earlier units have straight-cut gears on the driven axles and idler gear. The gear teeth are parallel to the axle. Later units have helical-cut gears. The gear teeth are at an angle to the axle. This is apparent upon close scrutiny. This was done for better mesh with the worm, I'm sure. The earliest units have the rear truck retained with a snap ring in the groove at the end of the motor worm and a washer under the snap ring. Later units use a copper retainer plate fastened to the truck with the front screw and slid into the groove on the end of the worm. Click the thumbnail to view the two truck variations (the shiny copper plate didn't come out too shiny in the scan): The snap ring method is on top and copper plate on the bottom.When I say earlier and later, it's relative because I don't think it took too long before Rivarossi went with the retainer plate method. Probably way too many complaints about lost snap rings from customers and dealers! For example, the first E8 I bought in November of 1967 had the snap ring and washer. I shortly had to return it to the hobby shop for an unrelated problem - it was squealing. I didn't realize it at the time but the squealing was caused by insufficient lower motor bearing lubrication. Anyway, the replacement loco I got already had the copper keeper plate retainer. At the time, I thought that there may have been a connection between the squealing and the truck retaining method but, with age and wisdom (right), I came to know that the two were separate issues. There are some variations regarding traction tire placement too. It seems that most of these units have the tires on the right side of the locomotive on the two driving axles. Of course if one-side insulated axles are used, it would dictate that the traction tires be on the right side to avoid a short circuit, the traction tire side being the insulated side. There are, however, some units with the tires on the left side of the locomotive and some with the tires on both wheels of the middle axle. These, of course, would be mounted on axles insulated on both ends. Dallas Mallerich indicates, again in the Greenberg guide, that some have tires on both wheels of the rear driving axle but I have never seen any like this. It is totally possible though. The famous (or infamous) Rivarossi can motor comes in colors! (sort of). The earliest ones are black (presumably so they can't be seen easily) and the later ones are one of two different colors of silver. Some have an almost stainless steel look to them and others have a more aluminum look. Here is an image of the three different "colors". Click on the thumbnail for a full sized image: Note that the worms would normally be pushed onto the motor shaft almost up to the bearing extension of the can. These are motors that I repaired and I didn't push them all the way on yet. 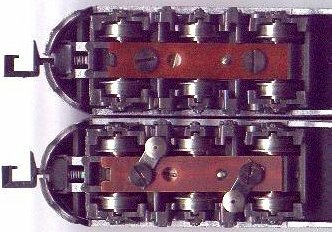 Also, the motor on the right has the plastic coupling on the shaft as used with a Pacific or Mikado. If it really was a Pacific or Mikado motor, it would also have the extended hot motor brush holder. The black motor cap has a mold number (1,2,3, or 4) and ITALY molded into one side and the stylized Rivarossi logo molded into the other side (both on the top of the cap). Sometimes the Rivarossi is on the right side when the motor is mounted and sometimes it's on the left. This doesn't matter as long as the motor can is oriented properly. There are two slots in the can into which the cap fits. These end up being at the front and rear of the motor mounting. One slot has a flat bottom and the other has a vee shaped bottom. The vee shaped slot MUST be at the ground end where the ground contact and brush attach (the rear end, in this case). If it's oriented incorrectly, the locomotive will go the wrong way for a given polarity on the track. Some of the brush holders have rounded heads on them, some have slightly concave heads, and some (most) have flat heads; all with a groove included around the head near the end. Sometimes the right rear and left front frame holes were used to mount the motor with screws and sometimes the right front and left rear; never all four, although that may have been the original intent since there are four holes. On early units, sometimes Rivarossi put washers under the screws and sometimes they didn't. Inside the motor, there are variations in the commutator form. 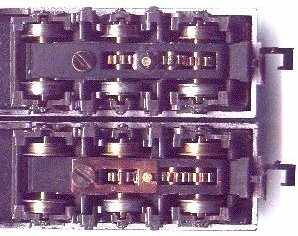 In the early units, the form is a little less substantial with only the slots in the flanges to keep the commutator segments in alignment and relatively thin flanges. Then there was a kind of transition where the shaft end flange is thicker and had recesses in it in which the tabs of the commutator segments are postioned. The armature end flange was still thin. The latest units have both flanges thicker and the recessed areas in the flange at the shaft end. These changes were no doubt due to the tendency of the commutator forms on the earlier units to crack or to cook and melt down from heat. Um, there were also different colors of wire used for the armature windings (OK getting a little too nutso). Dallas makes mention of a variation in the worm in that some have a flat edge and some have a beveled edge. I'm not really clear as to what he's referring here whether it's the edge toward the motor or the edge toward the end with the shaft and groove. I have seen only one type, however (beveled at the shaft end). For more detailed information about motor construction and service, please go to "The Rivarossi Motor" page. Also, any reference I have made to Dallas and his observations in the Greenberg guide are strictly for comparative purposes only and not to disagree with or otherwise reduce the importance of his work. His efforts in writing the Greenberg guide and compiling the information contained therein were monumental, especially considering his age at the time (17).